Apart from the largest and most important remnant patch of natural vegetation within the area, Meadowridge Common, there are a number of other less well documented open spaces which also contain an interestingly high number of indigenous plant species including a number not usually encountered within such an established suburb with the levels of disturbance present here. 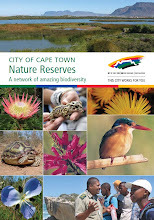 The natural vegetation cover found here originally was mostly Cape Flats Sand Fynbos found on light acidic sandy soil as well as Peninsula Granite Fynbos found on granite-derived clay. 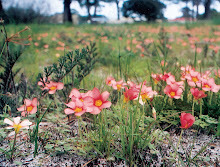 While Meadowridge common (an example of lowland acid-sand plain fynbos: CFSF) contains around 120 species of indigenous plants growing wild, other open spaces nearby have as much as over 40 species in some cases, as noted in the plant species list. Each locality was named usually according to the roads on which it is situated. In some cases species were recorded with the date first noted in order to give some idea of when they are present if not perennial, as many plants still persisting in the area are able to do so because they are geophytes (bulbs) or at least somewhat dormant for part of the year. Certain areas appear to be of greater botanical significance than are others, and the most important have been marked with an * after the locality name. Red data species marked with an * and all locally rare species in bold. The first locality is the street corner outside my house where I first noted wildflower species flowering. Although there don’t seem to be any particularly special or rare species present here it still shows how much diversity can be found in a seemingly uninteresting patch of grass if one looks carefully. The second locality is not far away but has quite a different and richer flora, including the red data species Babiana villosula. This species was greatly abundant here when first recorded but has been greatly depleted seemingly by theft of the plants when in flower and easily noticed, which is quite worrying considering the status of the species. Empodium plicatum is not at all common at least locally and has decreased greatly in number to hardly any individuals on Meadowridge common, yet it occurs here in great abundance, and so this location is of great importance for the survival of these 2 species mentioned. Fountain road park is perhaps the most important locality botanically after Meadowridge common, as it has the highest recorded number of plant species, generally has the least disturbed sandy soil, is mostly free of alien invasive grasses which many other open spaces are affected by, and has a number of locally rare species as well as the endangered Lampranthus reptans and threatened Babiana villosula. The corner of Bergvliet and Heerengracht roads is interesting as it supports many different species to Fountain road park even though it is close by, due to having more clayey soil with species perhaps more commonly found in granite fynbos or on laterite such as on Rondebosch common, with species such as Micranthus tubulosus and Aizoon sarmentosum. The corner of Heerengracht and Ladies Mile roads is also close to Fountain road park but there is also a noticeable difference is species composition but also a surprising species richness for the size of the locality. Babiana ambigua, while not a threatened species, is not common in the area and while it is quite abundant here, it is otherwise only found as a couple of individuals on Meadowridge common. Laperousia anceps is an interesting find also and only one plant was ever found here, but nowhere else nearby. The open space in Molinera way is seemingly much less interesting in terms of species richness, and is partly invaded with kikuyu grass, but may still contain more species which have not yet been seen there. The corner of Howard drive and Firgrove way does not contain any particularly important or rare species but its close proximity and link to Meadowridge common would make it worthwhile to include this locality as part of the common to increase its area and thus its conservation potential. Although these areas contain the numbers of species that they do as well as the rare and threatened species that have been recorded in spite of decades of being surrounded by suburbia, there are various threats to the continued survival of the plant species found here. Perhaps the most obvious is that of ill-informed mowing regimes which are intended to keep grass low but at the same time annihilate many unnoticed wild flowers at the time when they are at their most active and thus most vulnerable to such disturbance. 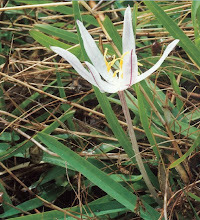 When a small geophyte puts all its available resources into growing leaves and flowers, which are subsequently chopped off, the chances are high that it will not be able to make up its loss before the end of the growing season. Many less hardy species likely were present at these localities but died out long ago, and over the years the persistent mowing is likely decreasing diversity species by species until only the more hardy and weedy species remain. There is still a chance now to save what species remain before it is too late, but there needs to be action now. Firstly, most grass species that look unsightly and grow at all tall are invasive alien grasses and often seeded from gardens by uncontrolled refuse dumping. Clump-forming Eragrostis grass is often used as the excuse for frequent mowing, but this only stimulates this grass to grow more vigorously. Instead of mowing so often it could easily be removed manually by pulling it out and then areas where this grass is currently a problem would need to be mowed far less frequently. Likewise with Kikuyu grass, mowing only helps to spread it further and increase the rate at which it spreads. Although methods of control are not as easy, effective spraying with specific herbicides can control it. Therefore, if invasive grasses were controlled where they are currently established in these areas of interest, and further establishments of invasive grasses were prevented where possible, these areas would hardly ever need to be mown if ever, as the persisting natural vegetation mostly consists of bulbs and ground creeping species, with some small growing perennial shrubs. While mowing is a major issue, dumping also has a negative impact. 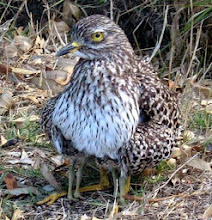 As mentioned, dumping of grass cuttings and other garden refuse spreads seeds of many species which can potentially invade these areas and outcompete the indigenous species. Builders rubble has been dumped and even worse mixed into the soil particularly on one side of Wren-Lister park and Fountain road park, in both cases altering the soil chemistry and only being overgrown with weeds and grasses common in disturbed areas, with no indigenous species of interest present. These weeds then spread further into the area and look unsightly and grow thick thus needing to be mown or brush-cut. The rubble in Wren-lister way park led to the establishment of a clump of Port Jackson which looks a mess now and could threaten the Babianas and Empodiums present there. If regulations were properly enforced and fines issues as they are supposed to be where this happens, it could be prevented from happening in future. A number of the plants of interest in the area of very ornamental when in flower, and it seems that plants are being stolen by people when in flower, and often that is when plants are most sensitive and so just die. 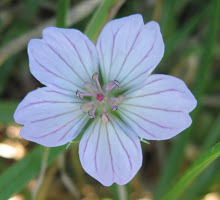 It seems that this is the case with both Babiana species found in the area, in particular on Meadowridge common. Plants are also at risk from being dug up by dogs or people as in the case of Fountain road park and Meadowridge common where for a while children were digging holes for bicycle humps and in the process destroying patches of Babiana villosula and Lampranthus reptans. Perhaps educating people in the local area about the special species present here would help to make people interesting in conserving what is still found here. The most important thing though is that something needs to be done as soon as possible to prevent more of our local natural heritage from being lost, mostly as a result of ignorance. 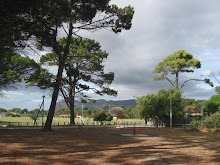 Meadowridge and Bergvliet are privileged to have these open spaces and the fact that wildflower species occur where they do makes them of importance both for recreation and conservation potential. Hexaglottis virgata (only leaf) ?